The White House is doing its part in leading the way to a more sustainable nation. Not only are they growing their own food on site with Michelle Obama’s garden, but now even they’re aiming for LEED certification! The Obamas are trying to show that reducing energy use and leading a greener life really aren’t that hard. This certainly isn’t the first attempt to green the White House, but it’s definitely the most significant attempt to date. The Federal Energy Management Program (FEMP) and the White House Council on Environmental Quality (CEQ) are leading the effort to upgrade to more energy efficient equipment, improve procurement, reduce waste and toxins and lower the overall carbon footprint of the complex. 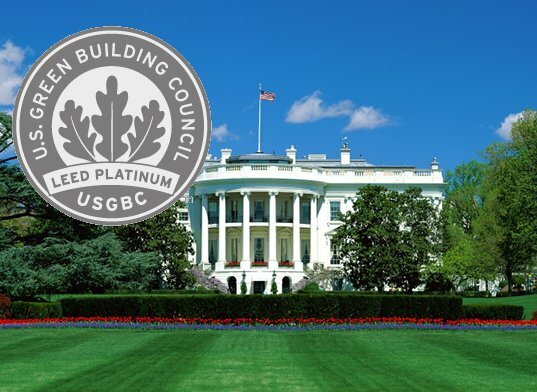 Rick Fedrizzi, CEO and president of USGBC, is offering up his expertise to help the White House achieve certification. “LEED certification of the White House is absolutely possible and viable,” Fedrizzi says. Although such an important structure will definitely make a historic renovation more challenging than any other building. “A normal building is already a challenging assignment, and this is something that’s a historic structure, one of [the] nation’s most historic structures,” he says. Windowpanes, which are typically replaced to improve the efficiency of the building’s envelope, will not be able to be replaced at the White House because of their historic glazing. Instead alternatives like window films will have to be explored for higher efficiency. Also the heightened security of the compound will add complexity to the certification process. Otherwise the staff is looking into making improvements into the procurement policies, aiming to consider toxicity and life cycles when making purchases. They’ll buy biodegradable cleaners, recycled content products, and low VOC paints. The Council on Environmental Quality is looking into ways to reduce energy use through energy management, more efficient heating, cooling and ventilation systems, and automatic light sensors. They will also upgrade to low flow water fixtures and get rid of cooling equipment that contains ozone damaging chlorofluorocarbons (CFCs). Additionally, staff will be educated and trained to use recycled content whenever possible as well as to reduce the waste stream. Both Jimmy Carter and Bill Clinton made upgrades to the White House and cut energy use, and George W. Bush installed a small photovoltaic system and two solar water-heating systems. But seeking LEED certification is a significant step forward and a great example for the nation. We wait in anticipation to see what technologies and systems the White House uses in its upgrades on the road to LEED certification. What level of do you think they’ll achieve? Silver, Gold, or Platinum? This is fantastic - at last a President who is willing to go all out to show the country that energy efficiency is a necessary and viable approach to addressing climate change. Bravo Obama. 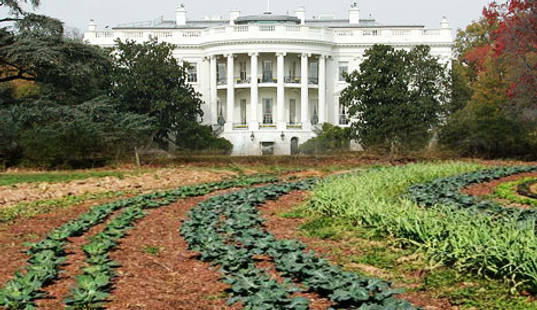 I love the picture of the White House garden!! It's so inspiring. I'd like to see a weatherization barnraising on the White House with the participation of "This Old House," Extreme Makeover: Home Edition," HGTV, current.tv, DIY channel.... We've been doing monthly weatherization barnraisings in Cambridge, MA for a little over a year now and already a number of other surrounding communities are beginning their own. The White House is doing its part in leading the way to a more sustainable nation. Not only are they growing their own food on site with Michelle Obama's garden, but now even they're aiming for LEED certification! The Obamas are trying to show that reducing energy use and leading a greener life really aren't that hard. This certainly isn't the first attempt to green the White House, but it's definitely the most significant attempt to date. The Federal Energy Management Program (FEMP) and the White House Council on Environmental Quality (CEQ) are leading the effort to upgrade to more energy efficient equipment, improve procurement, reduce waste and toxins and lower the overall carbon footprint of the complex.